Don’t you just love cookie making this time of year? 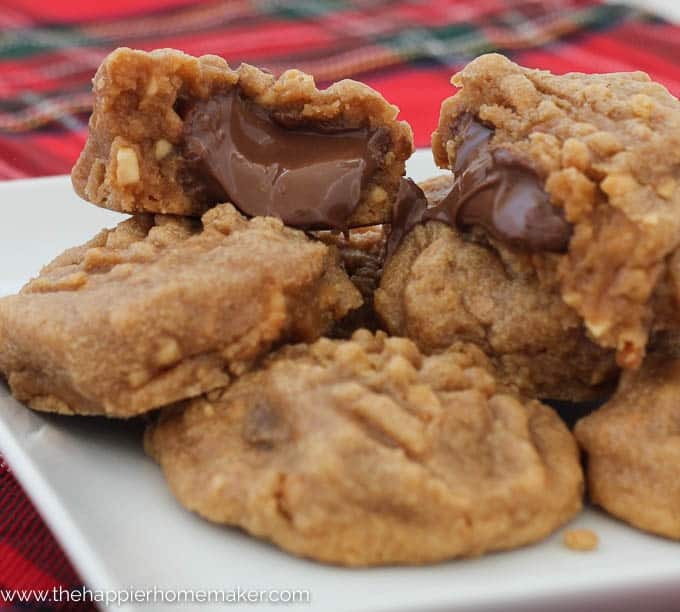 I’m excited to share one of my new favorite recipes with you today-Nutella Stuffed Peanut Butter Cookies! 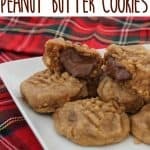 This is an adaptation of my 4 ingredient gluten free Peanut Butter Cookie Recipe….it’s hard to make the classic recipe better but I gave it a shot by stuffing it with ooey-gooey Nutella! The key to stuffing Nutella into the cookies is to freeze the Nutella beforehand so that you can seal the cookie dough around it and keep it. I find it easiest to also chill my peanut butter cookie dough as well so it’s not so sticky to work with while forming the cookie around the frozen Nutella. 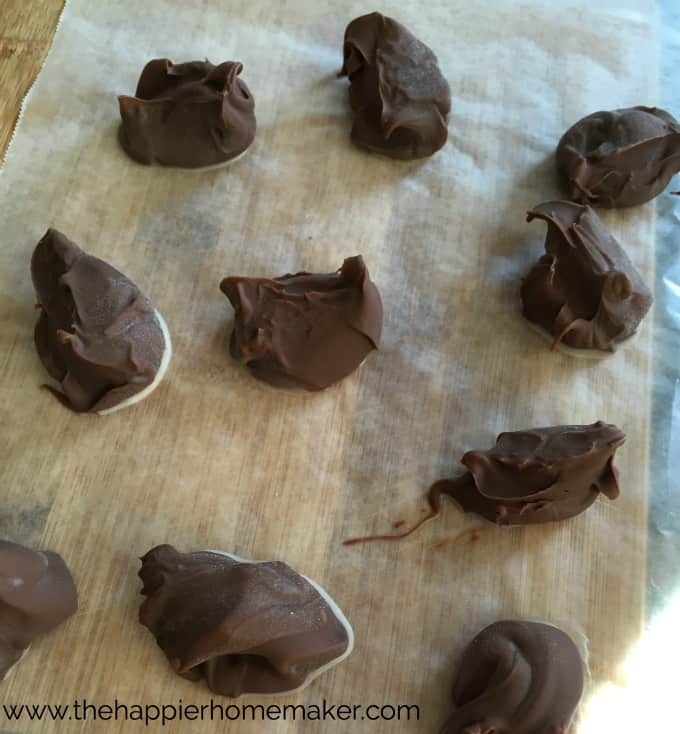 Freeze (12) 1 tsp “dollops” of Nutella on wax paper for at least 12 hours before baking cookies. In a bowl combine all ingredients. Refrigerate for an hour before proceeding. Preheat oven to to 350 degrees. Make two 1″ balls of cookie dough. 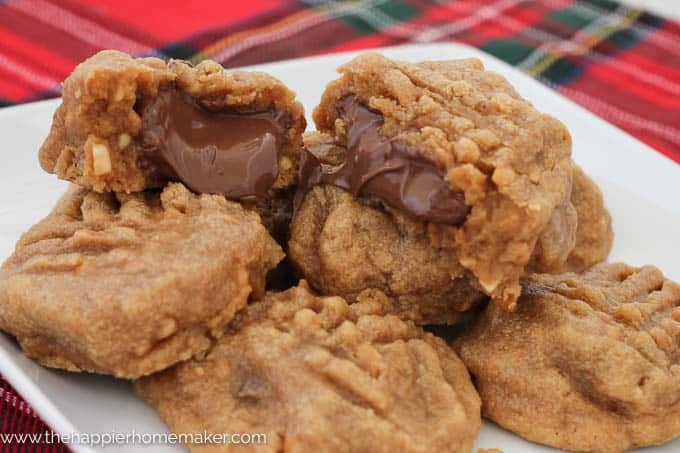 Sandwich Nutella between the two cookie dough balls and press together to surround Nutella with cookie dough (make sure dough is completely sealed around Nutella so it doesn’t leak out! Place on greased cookie sheet. If desired add the classic peanut butter cookie cross hatch by pressing a fork sprayed with nonstick spray into the top of each cookie. « 20+ DIY Christmas Ornaments and DIY Christmas Decorations!! previous post: 20+ DIY Christmas Ornaments and DIY Christmas Decorations!! These look so good! Peanut butter + Nutella = Win! Oh my gosh, these look amazing! 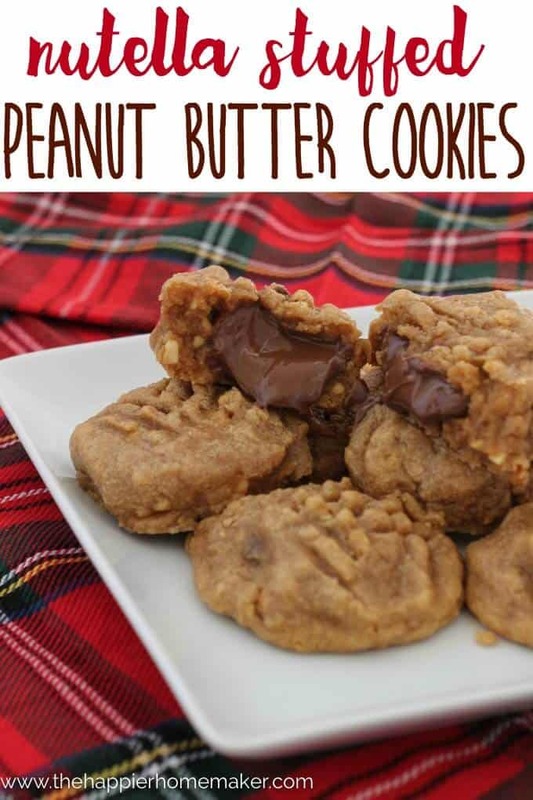 My kids love nutella and peanut butter so I will be trying these for sure! Pinning! These look so good!!!! They seem pretty simple to make too! Thanks so much for being a part of this year’s HFTH Tour! I seriously didn’t even want to keep reading once I saw the title because I knew I would be drooling all over my computer… and I was right! So so yummy- can’t wait to try! Hello!!! 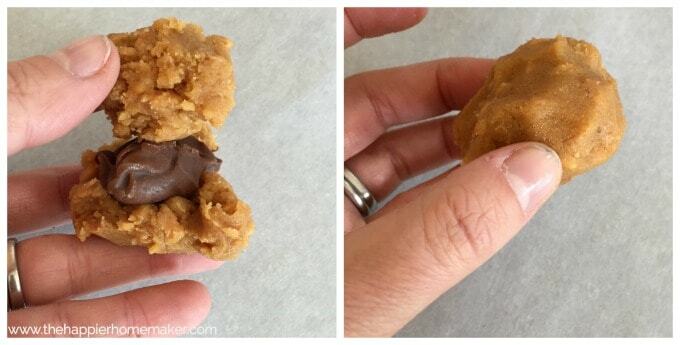 Peanut butter & Nutella… YES! This is a perfect combination! They look amazing! All these yummy recipes are making me hungry. I am freezing nutella as I type this. OH MY COOKIE!! You had me at Nutella, Melissa! Okay, you had me at peanut butter too! Seriously, these sound amazing … and thanks for the tip about freezing the Nutella! These are going on my to-make list soon! Gluten free and Nutella together! I need this in my life! Thanks so much for sharing a new to me recipe. I can hardly wait to try it. Oh gosh…what could be better than peanut butter and Nutella?? These look delicious and we love your tips about freezing. Definitely going to be making these for an upcoming party!~Thanks for sharing! Oh, you just put two of my favorites together into one happy package!!! How can I resist the temptation? Definitely pinning! OMG you had me at Nutella!! My mouth is watering just looking at your photos. YUM!!!! I can’t wait to try these!